Mmm.. nothing like some cotton candy!! It that Cotton Candy I see? that sugar rush, yummy, those were the days! Yum! Cotton Candy makes some fun pics!! who doesn't love some cotton candy!!! cute! Mmm! Gotta love the blue mouth! LOL - Love the blue mouth. I'm not a fan of cotton candy myself but my 4 year old thinks it's the best thing ever invented ! My boys wouldn't even touch cotton candy! LOL Great pictures. Ok, now I want some cotton candy! Cotton candy looks yummy! LOve the blue mouth! Cute photos! 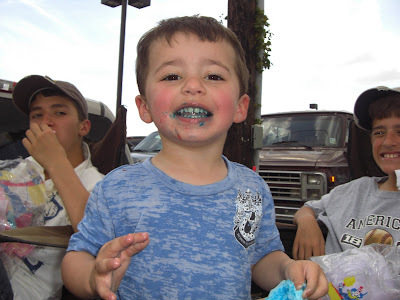 That must have been some good cotton candy. Mmm, cotton candy sounds good. Very cute photos! I love the blue mouth and teeth. 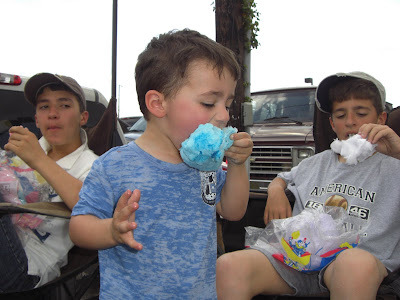 Looks like he was having a good time with that cotton candy. Yum! Gotta love cotton candy! So cute!! !